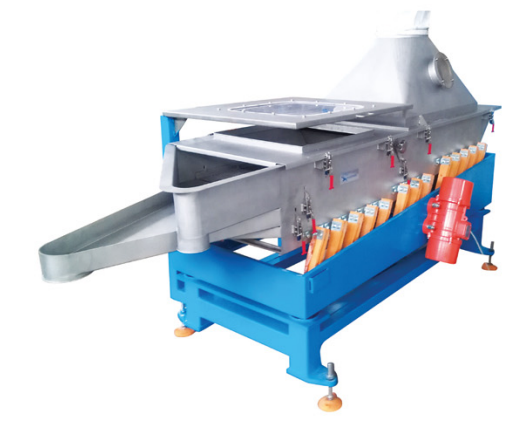 The feedng section is equipped with washing board. lo realize polishing treatment of tail burr of the granule through high-intensity rociprocating vibrabion. Besides, it's equiped with fuidized bed and air heater. Materials turn around continously on the fludized bed and air heator. for fluidization, remove the moisture & fines on the particle surface under the shearingaction of high-speed hot air, and eliminate the electrostatic adsorption phenomenon ofpowder effectively by virtue of ion neutralization static electricity. In addition, thedischarging section is equipped with jacket for water cooling so that the materials afterscreening can be cooled rapidly. Extended functions of the 4th generation of theequipment subsequently are under development synchronously. The equipment is simple& compact, can be used for various purposes and canimprove the product quality & added value remarkably. 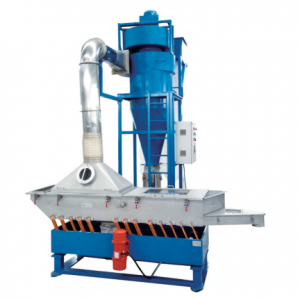 With the special design of double-mass resonance structure, it can realize stablereciprocating vibration under natural frequency, distinctly different from the traditionalsieving force transmission mode by forced straight vibration. There isn't disorderlyshock excitation inside the casing and it can resist against long-term vibration without any crack. With function modularization design, it can be equipped with different modulesaccording to different demands.